Sistine Chapel Smoke in 58: "definitely white in color"
The following *book, published less than 4 months after the 1958 Conclave, provides historic information on the quote, "definitely white in color" smoke seen belching from the chimney of the Sistine Chapel (which indicated Pius XII's hand-picked Successor, Cardinal Siri of Genoa, Italy, had been elected and accepted the office as pope, Gregory XVII, on October 26th, 1958). *The book is cited for historical reference purposes and is not an endorsement for the text. 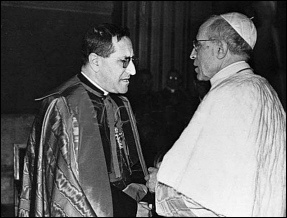 "Pope John XXIII Comes To The Vatican"
By Francis X. Murphy, C.SS.R. Robert M. McBride Co., Inc.
"It would be safe to say that never in history had so much attention been paid to an ecclesiastical affair. Rome on the eve of the Conclave was inundated with journalists and correspondents, broadcasters and television men from almost every free country in the world. Once the Conclave was in session, the eyes of the world were trained on the narrow smoke-stack protruding from the great hall within the Sistine Chapel whence by a puff of white smoke the joyful news that a new Pope had been elected would first be signaled to the world. Meanwhile Catholics prayed; the cardinals deliberated; the world watched." Chapter 2. "A Man Called John ..."
"THE CONCLAVE OF CARDINALS had been in session for three days. The world waited. Devout Catholics prayed. At mass each morning priests throughout the world added an extra oration to the usual prayers of the divine liturgy: pro elegendo papa 'for the election of a Pope.' In religious communities monks and nuns beseeched almighty God that a holy Pope be given to the Church. And over the assembled cardinals, the divine assistance through the intercession of the Holy Spirit was earnestly sought. To watchers stationed in strategic spots close to the Sistine Chapel roof, the puffs of smoke emitted from the slim stack... on Sunday (Oct 26, 1958 -ED) were confusing. White smoke should indicate the election of a Pontiff, for it would mean that in the burning of the ballots, no dampened straw would have been added. But the first belchings had been definitely white in color, followed only at an interval by definitely black smoke. A New Perfidious "Sedevacantist Type" Sect Emerging? The French have a saying: "Whoever eats of the Pope dies." If 2/3 of the Cardinalate favor a candidate, are the ballots thus burnt to produce white smoke, or do they weight until the Candidate says "Accepto" or "Non?" The ballots are burnt only after the Pope has accepted the Papacy. The ballots are then burnt with dry straw, which produces white smoke.